Last month I bought a March 2013 Land Rover Freelander 2 Diesel SW 2.2 TD4 GS, 18,363 miles from a Land Rover dealership. At the time of purchase I asked the salesman if the engine had a chain or belt camdrive. He said that he thought it had a chain drive. I have since asked a Land Rover Service manager who checked the spec. for the chassis number and he told me it was listed as having both chain and belt drives. I'm not sure if that means one or the other or both, chain for the cam and belt for the auxiliaries. I was alarmed to read in today’s Telegraph under your reply 'Brisk assessment' that diesel engines need new timing belt, tensioner etc every 4 years. This implies that the car I have just bought will need some rather expensive maintenance in just 2 months time. Does this model in fact need a timing belt change in March and if so can I insist the dealership does this work FoC? Or can I legitimately reject the car and get a refund? The 2,179cc DW12 is a PSA/Ford 2.2 litre engine, with primary timing belt and a chain between the two camshafts. The engine needs new timing belt, tensioner, waterpump and separate aux belt every 4 years or 60k miles whichever comes first. 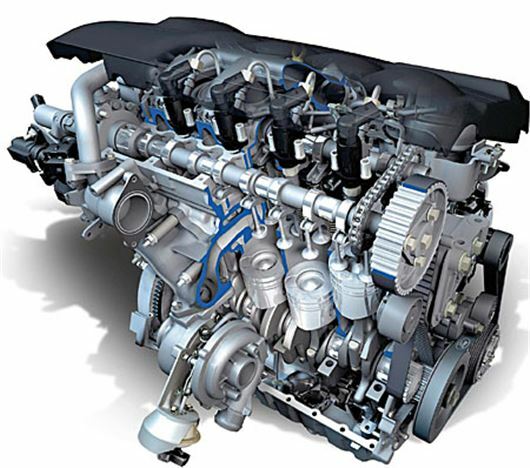 The Ford DuraTorque 2.0 and 2.2 diesels used in the Mondeo Mk III have a tough Duplex chain drive to the camshafts, but have a reputation for being “sooty”. Before getting too hysterical about the supposed dangers of diesel emissions, should we be careful not to lose the huge safety advantage of a fuel that does not readily burn? Some while ago my daughter strapped her two toddlers into the back of her VW Golf diesel and set off for the swimming pool, unaware that a split pipe was allowing fuel to spray over the engine and trickle onto the road. As long as her car was moving briskly forwards, the smell of hot diesel was not apparent but became overpowering when the engine ran out of fuel and stopped leading to a rapid but safe exit of driver and children. There was no fire. The service manager of our local VW agency said he was pretty sure the damage had been caused by rats chewing the fuel pipe, something he had seen more than once before. When I asked what might have happened if the car had been a petrol model, he preferred not to speculate. Me neither, but happily I do still have a daughter and two grandsons. That's a fair point, but current hysteria is about how NOx causes lung disease and some very high figures for deaths from this are being bandied about which, of course, don't account for all the other causes of lung disease and all the other ways these self-same people could have died. We are planning to replace our 2002, 193k BMW X5 3.0d Sport while it still has some 2nd hand value. Now we are retired, we only seem to cover 11k miles a year, of which some 3000 are towing a caravan, largely on the continent. Most of our UK driving is local, with the odd run up the motorway. We need space to carry a cage for our two dogs. We are unsure whether a diesel or petrol engine would suit us best, given the mileage versus the need for towing capability. We feel that diesel is likely to become less acceptable as time goes on, especially in towns. However, we are looking for something which is economical to run as a day-to-day vehicle and which will last for a number of years. We are in our mid 60s and both enjoy driving. We would like something that is fun to drive and that would not feel underpowered when towing up long hills and would like another automatic. We would also like something with some "street cred", so the likes of a Citroen Berlingo are out. Our budget will be in the region of £15 - £20k. What makes and models would you suggest we consider and would we be advised to go for petrol or diesel this time? There isn't really much choice in your price bracket. You either go for a real guzzler with a big V8 petrol engine, or you go for a Lexus RX450h hybrid, or you go for another diesel and suffer the potential DPF and EGR consequences. After towing up a long hill, any turbocharged engine must be left running for at least 5 minutes before switching off or the oil in its turbo will carbonise. I recently received notice of a £100 fine and 3 points on my licence. This was for driving at 76 mph on the A303 near junction 5 in Somerset. I saw a speed camera van ahead of me and made sure I was doing an indicated speed of 72 mph as I went past it, I thought this was legal allowing for speedometer variations. I was very shocked to be told that the limit for vans and van-derived vehicles is 60. I have spoken to a lot of people who drive vans since, very few of which new this was the case. I don't feel safe driving at 60 on the 303 with lorries creeping past and vans flying by. How can this be right? Yours sincerely a 53 year old with no points on his licence until now. On dual carriageways where a saloon car may be driven at 70mph, a Transit van, being a goods vehicle and not a "car derived van", is restricted by its class to a speed limit of 60mph. I am planning to replace my diesel Santa Fe but am cautious about buying another diesel given the recent discovery of nitrogen oxides pollution problems. But I am also surprised that most of the major car manufactures continue with the sale of diesel cars and do not offer any increased discount to mitigate the possible longer-term problem of increased taxation on diesel cars. This seems to apply to all bigger cars that are only available with diesel engines. Are they presuming there is no point in developing petrol engines as electric cars will be fully available around in the near future. What is going on? They can't all develop petrol engines that substitute for diesel engines in all applications, particularly in big SUVs where the fuel consumption would be appalling. What might work are petrol hybrids. The fuel economy of a Volvo XC90 T8 is 25% better than a Volvo XC90 Diesel, and that is despite not plugging in the XC90 PHEV before testing it. Similar for a Lexus RX450h that is not ‘plug in’ and for the BMW X5 xDrive 40e. My wife has received a letter from the police asking her to name the driver of her car at 3.15pm on 27 October 2016. It also states that the car was allegedly involved in a collision, did not stop and did not report the incident. My wife and I are the only ones insured to drive the car and neither of us has any knowledge of the alleged offence and are certain that neither of us was involved. That being so we have no idea who might have been driving it on, what to us was an uneventful day more than ten weeks earlier. Neither is there any noticeable damage to our car. However the location is a local one that we do visit from time to time, so it is possible that we may have been thereabouts at that time. How should we respond? As you have to me. The fact that your car's registration has been recorded does not mean that your car was involved in the offence. A very significant number of mistakes are made from numberplate readings and it is also possible that your plate has been cloned. Invite the police to inspect your car. Please may I have a fair value for both a private sale and part exchange for my 2003 SAAB convertible Vector 2T petrol, 105,000 miles, full and documented service history as per manufacturer requirements, garaged and in excellent condition both inside and out. All you have to do is key in the registration and mileage of your car here: /used-prices/ Almost by return you will receive an email giving you retail, private sale and p/x values. The new VED coming in on the 1st April will make eco friendly small engines, like the Ford EcoBoost and also Hybrids, etc. pointless, won’t it? Even Tesla Electric vehicles will have to pay £350 for the first 5 years as they are over £40,000. But then, have I got this right, after 5 years, even the most polluting vehicles will only be £140 per year? I thought of changing my car for one with less VED before the new rules. I tried a Ford Fiesta ECO Boost but I couldn’t bear to change my Honda Jazz for it. My Honda Jazz is 6 years old, only done 33,000 miles, I like it, costs £130 VED, I think, might as well keep it. But, I was also looking at buying a VW California I have a camper van as well as my car, VW T4 18 years old, VED £240 (I think) ) but I am waiting for the petrol engine. It is over £40,000 so an extra £350 per year VED for the next 5 years applies. I don’t really see what George Osborne was trying to achieve apart from more money to the Treasury. I think this will increase pollution. Why buy an eco friendly car if it is taxed at the same rate as a bigger car? First year CO2 based tax from April 2017 is actually 2 - 3 times higher. It's only from the 2nd year that the tax is £140pa or £450pa. But you're right. CO2 based tax created a huge black hole in tax revenue that had to be filled. Either that or another rise in VAT or a rise in income tax. There was an MGB automatic. So the parts are available. It’s a matter of finding an MGB specialist who can do the work, but it's going to be hugely expensive and definitely not worth doing if your car is not already 100%. Probably better to try to find an existing MGB automatic that has not been converted to manual (as many were). Or look for a factory Mazda MX5 auto, which were briefly available twice over the past 30 years. Our four vehicles cars: a 2002 Audi A4 1.9TDI (in the family since very near new), a 2001 Jaguar XK8, my wife's 2005 Nissan Micra, and a 2001 FIAT Ducato 2.8JTD Campervan (also in the family since very near new) are all currently covered for breakdown by Green Flag (to March 2017). They are all serviced every year and are in top condition. The Audi mileage is 110,000, Camper only 65,000, and the Jaguar only 65,000. Only one breakdown callout by us in then last 10 years, and that was in UK for a binding front brake on the Camper. Green Flag's (and AA’s and RAC’s) conditions state that only vehicles 16 years or younger can will be covered. What therefore should we do after this year for this cover? We intend to continue owning and using all of these vehicles for the foreseeable future (several years we hope), because they are well looked after, very reliable and we like them. A friend (wise with cars) suggested not taking out breakdown cover in future but to rely on finding a garage in the vicinity of any breakdown online with a smartphone (both here and in France where we travel regularly: we are fluent in French). We are luckily able to "insure ourselves". We CAN afford breakdown and recovery costs if they occur. My wife and I are 69 and 71. Any advice would be much appreciated. You have to see it from their point of view. As the vehicles age, the risk of breakdown increases. The breakdown insurers could increase the cost of cover to match their risk, but you would probably find that cost unacceptable. That leaves you with old vehicles on which you are forced to take the risk. I did a Google search looking for alternatives but did not get anywhere. If the cars are considered 'classics' and are on classic car insurance policies you may find that your classic car insurer is prepared to take the risk based on limited mileage. My first car was a Mk1 Golf nearly forty years ago the start of a long love affair culminating with the excellent GTI.We currently have a Polo on the family fleet but it will be the last. Despite them all being petrol I am disgusted at the breathtaking arrogance and disdain that VW has behaved in the U.K. regarding dieselgate and urge my fellow countrymen to vote with their wallets. Last year, though Volkswagen sales in the UK fell by more than 16,000, total VAG sales were only down by 850 cars. Audi and Skoda sales were up. The scandal has stuck to the Volkswagen name, ignoring the other VAG cars with the same components. I give you warning Im going into rant mode here. Since this VW thing started I have been getting angry at the bandwagen jumping thats going on with half truths, truths that are said in the most missleading way Diesel emissions are bad, yes but so are petrol emissions, particulates for Euro 6 are the same for both and NOx is only 25% lower for petrol. Thats not going to solve the situation is it? Ok in practice diesels emits more in real life but so does petrol and no one is looking at that, well not yet anyway. Particulates are the same for both. These petrol small capacity high output turbo & supercharged engines that are so efficient emit more NOx and particulates than their thirsty large capacity equivalents but much less CO2. So which do we want? NOx that stays in the atmosphere for a few day and is not a greenhouse gas or CO2 that stays in the atmosphere of many years and is a greenhouse gas. VW are having to fit a particulate filter to their models.of petrol cars.petrol NOx kills thousands of people the headline says, well maybe, maybe not it depends how you look at it. According to the BBC web site the way that is worked out is like this. Smoking shortens your life by 10 years, being obese shortens your life by 7 years, and if you work and live in the city NOx shortens your life by 30 days. So if you multiply 30 by the number in a city and divide by the number of days in a life that gives the equivalent of the number of people killed. To me that is a very distorted way of seeing things and in the context of modern living there are much worse thing. There is no doubt diesels in a city are not great but petrol is not much better, its the old unregulated vehicles that are the problem in cities where the high building trap the pollutants and allow them to build up in concentration. in fact if you drive your diesel in the countryside past a heard of cows you are doing positive good because the NOx rremoves Methane, the very worst greenhouse gas, from the atmosphere. Electric cars are great but we are decades away, the national grid could not supply enough electricity to have any worth while numbers on the road. I suppose we could always burn coal to generate more!!! Yes I have been a bit flippant but you get my point we need a logical rational strategy not just an emotional demonisation of diesel or any one thing. Well I feel a bit calmer after that. Re breakdown cover for older cars - I have a Lloyds bank Silver account which costs (I think) £9.95 a month and one of the privileges is AA Breakdown cover for any vehicle in which you happen to be travelling. I have been recovered or repaired several times since I took out the account, including two different 20+ year old Toyota MR2s.